Time Stream - ZineWiki - the history and culture of zines, independent media and the small press. Time Stream was a science fiction fanzine from Columbus, Georgia, U.S.A. Following up their previous title, Worlds Apart, co-editors Paul D. Cox, J.T. Oliver, and Van Splawn released Time Stream in the Summer of 1951. Three issues may have been released. The Anthony Boucher Fanzine Collection (Arizona Archives) includes issue 2, from 1951, and The University of California Riverdale Library has issue 3 in its collection. 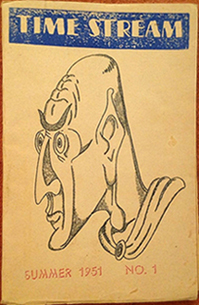 Contributors of artwork included Kraushaar. Contributors of writing included Thomas W. Butler, Paul Cox, Burt Lawrence, Beauregard Marlowe, Robert Silverberg (Spaceship), and F. Lee Baldwin (The Star Rover) writing about the artist Kraushaar under the title "That Martian, Kraushaar!". Poetry was contributed by Orma McCormick (Starlanes). Paul D. Cox also edited Just Plain Dill Pickle, Other Worlds, and Resonance. Van Splawn also edited Djinn, The Fantasmith, Mars, Prometheus, Soma, The Star Rover, and Symphony. J.T. Oliver wrote short stories, some of which appeared in several fanzines of this period, and others published in anthologies such as Fantasy Book (Fantasy Publishing Company, Inc.. 1951), Spaceway (1953), and Science and Sorcery (Zebra Books 1978), all edited by Garrett Ford, pseudonym of William Crawford, editor of Marvel Tales. In May 2013, Bill Plott, editor of Sporadic, published a one shot titled, The J.T. Oliver Photo Collection on eFanzines.com. which includes photos of J.T. Oliver and Paul Cox, co-editors of Worlds Apart and Time Stream, as well as Lee Hoffman, and other writers and fanzine publishers from the early years of the last century. This page was last modified on 18 February 2018, at 01:06.